SOUTH BEND – Notre Dame's first two plays from scrimmage went for 27 and 42 yards, respectively, and the drive ended in a touchdown three plays later. Then the next two Irish drives went three-and-out. So it went for the Irish in the first half, much like it did against Michigan; at times Notre Dame looked unstoppable and the offensive line opened huge holes for running back Jafar Armstrong. At other times, the Irish offense struggled to gain traction against a motivated Ball State defensive front. The inconsistency showed again in the second quarter when the Irish moved into Ball State territory for the first time since their opening possession. Notre Dame got a couple of first downs on an Armstrong run and a pass to tight end Cole Kmet. Later in the drive, quarterback Brandon Wimbush made a nice throw to Chase Claypool for 23 yards on 4th-and-8 to keep the drive alive and move the Irish into the red zone. Even as they were driving though, the Irish offensive line was struggling. Wimbush had to evade a rush on nearly every play on the drive and eventually took a 10-yard sack that forced the Irish to try a 43-yard field goal, which Justin Yoon pushed wide right. When he got up from the sack, Wimbush spiked the ball in frustration. He did a solid job of staring down pressure in the pocket, but had little time to go through his progression. When he did have time, his throws seemed to be just a little off target. He finished the half 7 for 16 for 131 yards and an interception. On a more positive note, the defense has looked dominant. The Cardinals moved the ball 85 yards and got a field goal on its opening possession, but went three-and-out on three consecutive possessions after that. Linebacker Te'von Coney has been a terror, totaling nine tackles, three for loss and a sack. Asmar Bilal also has a tackle for loss from the Rover position, while Julian love had six tackles and two pass break-ups. The Ball State run game was mostly quiet after rolling up 316 yards against Central Connecticut in Week 1, although quarterback Riley Neal had a couple long runs on scrambles. 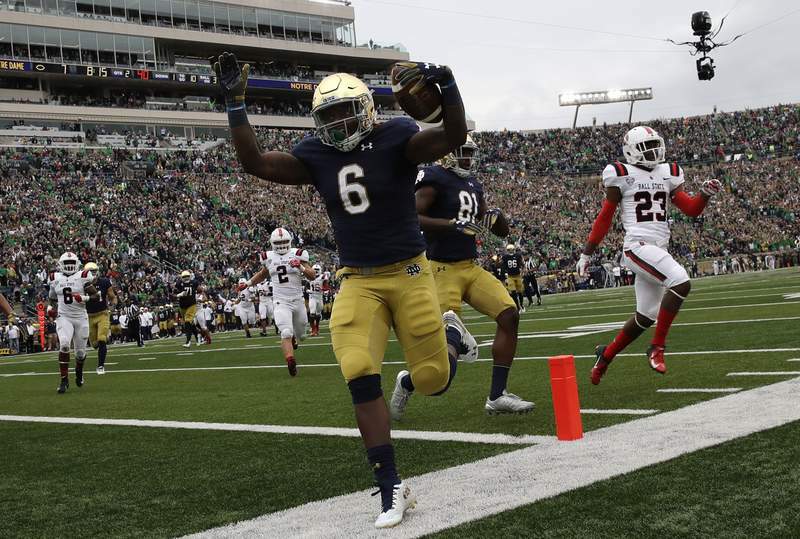 All week, it seemed as though the Ball State offense would have a better chance of hanging with the Irish, but the opposite has been true today. The biggest bright spot for the Notre Dame offense was Armstrong, who showed his versatility with 10 carries for 68 yards and three catches for 61 yards. He lined up at wide receiver on both of his catches and has shown the ability to make big plays at both positions. The redshirt freshman seems to be a focal point of the Irish offensive plans.